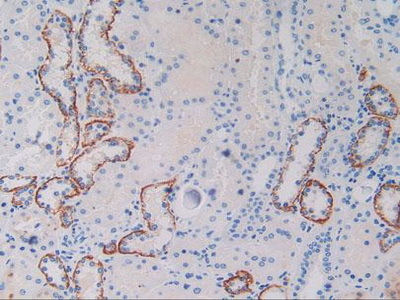 The antibody is a rabbit polyclonal antibody raised against HGFR. It has beenselected for its ability to recognize HGFR in immunohistochemical staining andwestern blotting. Recombinant HGFR (Val1092~Val1379) expressed in E Coli. Small volumes of anti-HGFR antibody vial(s) may occasionally become entrapped in the seal of the product vial during shipment and storage. If necessary, briefly centrifuge the vial on a tabletop centrifuge to dislodge any liquid in the container`s cap. Certain products may require to ship with dry ice and additional dry ice fee may apply. 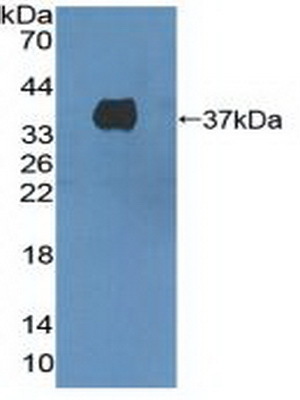 Western Blot: Sample: Recombinant HGFR, Human. 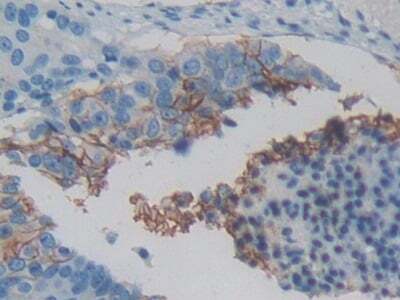 DAB staining on IHC-P; Samples: Human Lung Cancer Tissue. NCBI/Uniprot data below describe general gene information for HGFR. It may not necessarily be applicable to this product. Receptor tyrosine kinase that transduces signals from the extracellular matrix into the cytoplasm by binding to hepatocyte growth factor/HGF ligand. Regulates many physiological processes including proliferation, scattering, morphogenesis and survival. Ligand binding at the cell surface induces autophosphorylation of MET on its intracellular domain that provides docking sites for downstream signaling molecules. Following activation by ligand, interacts with the PI3-kinase subunit PIK3R1, PLCG1, SRC, GRB2, STAT3 or the adapter GAB1. Recruitment of these downstream effectors by MET leads to the activation of several signaling cascades including the RAS-ERK, PI3 kinase-AKT, or PLCgamma-PKC. The RAS-ERK activation is associated with the morphogenetic effects while PI3K/AKT coordinates prosurvival effects. During embryonic development, MET signaling plays a role in gastrulation, development and migration of muscles and neuronal precursors, angiogenesis and kidney formation. In adults, participates in wound healing as well as organ regeneration and tissue remodeling. Promotes also differentiation and proliferation of hematopoietic cells. May regulate cortical bone osteogenesis (). 1. Selective MET tyrosine kinase inhibitor SAR125844 has significant antitumour activity in patients with MET-amplified non-small cell lung carcinoma.